For a city so associated with Cantopop, Hong Kong is a surprising hotbed of heavy metal activity. A look at the lineup at venues like Hidden Agenda and The Hang Out shows them groaning under the weight of heavy metals acts. Now, even giants of the genre are coming to Hong Kong – we talked to Metallica ahead of their gig here in January and Megadeth are playing Star Hall in May. What’s better than one superstar band? How about five of the greatest guitarists alive playing together on stage at the same time. 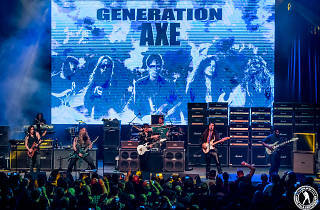 That’s what Generation Axe promises. Headed by legendary axeman Steve Vai, a multiple Grammy Award winner who’s played with the likes of Frank Zappa and Ozzy Osbourne, the line-up also includes Swedish icon Yngwie Malmsteen, former Ozzy Osbourne guitarist Zakk Wylde, Nuno Bettencourt of Extreme and Tosin Abasi, founder of Animals as Leaders. So you’re playing at Generation Axe on April 12 in KITEC’s Star Hall. What’s this night all about? I had an idea many years ago to create a show with one backing band and these exceptional guitar players. I was just waiting for the right moment to do it. And one day I had a phone call from [American music and entertainment guru] Miles Copeland who was looking to organise a guitar festival. So I presented my idea because I really wanted to do something different which wasn’t genre specific. However, I then decided to go for metal guitar players because I can fit well into that genre. I made a list of 30 exceptional guitar players and called the first five. They were all interested so I didn’t call any others on the list. The idea is to write a show where each player gets the opportunity to shine on their own and also play with the other guitarists. And when we all play together it is cohesive and not noisy or distracting to the audience. We all respect each other and the songs create a symphony for the audience’s ears. It’s a powerful show that doesn’t give the players or the audience an audio hernia! There’s Malmsteen, Wylde, Abasi and Nuno Bettencourt also on the bill. What’s it like sharing a stage with these guitar heroes? The thing I like the most about the show is the camaraderie. We support each other and tell stories together. I mean, we’ve all been doing this for many years. We all know the ropes. We all have very powerful personalities but the creativity is at the forefront of the show. You have a tendency to up your own game when you’re on stage with such great players. They are doing what they do at the top of their careers. Each of you is an axe virtuoso with international appeal. How difficult is that to actually make the music work when you all play together? It is a challenge. We have to become one mind and listen to each other very carefully. We all have to blend our frequency with the others otherwise it would become a total mess! You’ve done a US tour with Generation Axe but this is your first tour of Asia. Excited? It’s exciting to know there’s an audience that’s interested in this show in Asia. For me it’s very exciting because I love to tour and I love going to Asia. I also love being with friends who happen to be outstanding guitar players. I’m so lucky to be doing what I love to do and I’m really excited about doing what I love in Asia. Have you ever been to Hong Kong before? Yes, I’ve done two shows there in the past. I remember being struck by how unique the culture is in Hong Kong. I did a lot of touristy things like taking a helicopter over the city and going up to The Peak but I also loved discovering Hong Kong culture. It’s a great city. What are you most looking forward to with the show at Star Hall? I’m looking forward to bringing something to the Hong Kong people that they have never seen before. A unique, powerful, enjoyable show featuring five guitarists who are being the best entertainers they can be. Any gig on the tour you’re looking forward to playing the most? I’m really looking forward to going to Hong Kong, Korea, China, Japan, Singapore and the other places on the Asian tour. I don’t put a specific country or city over another. These are all fascinating places to go to. It’s just great to be able to play in all of these places. But I have recognised in the past that various audiences want to express themselves differently across the world and Asian audiences tend to be very respectful and exuberant and polite. But I’m looking forward to them all! Asian people seem to have a unique gene for virtuosity. You can see that in classical performers and guitar players from Asia. There’s a fascination for extreme techniques. It’s always been that way for as far as I remember. 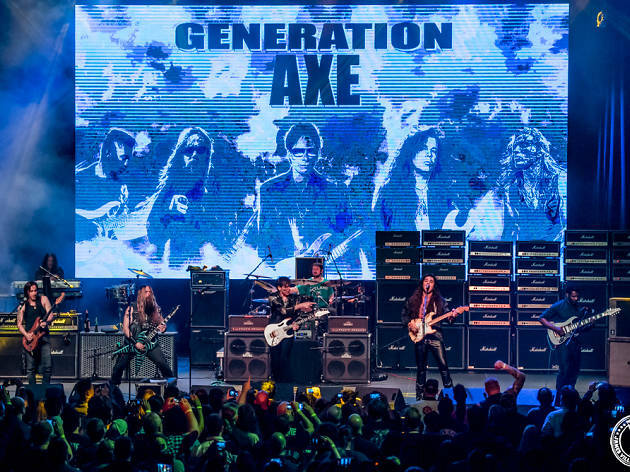 It’s one of the reasons why I think Generation Axe has been well received in Asia because we play our asses off and Asian audiences will appreciate that. You’ve had an incredible career over 35-plus years. What’s the ride been like? Like anybody’s life, it changes. It’s based on your perspective at any given time. In many aspects, I was blind for a good deal of my career. But as you go through life and get more experienced and get older, there’s a tendency to chill out. This is the big difference now. Chilling out is very useful and helpful in the effectiveness of everything you do creatively. My enjoyment of the creative process has flowered over the years. On the subject of ‘creatively flowering’, how have you been able to push the boundaries of the guitar further and further over this long career? I have never tried to push the boundaries of the guitar in regards to what everyone else is doing. I have only tried to push my own boundaries. You are only ever really raising your own bar. That’s all you can ever do. Certain things I’ve done have been very innovative. But I’m just pushing myself to be innovative. Any tips for young wannabe guitarists in Hong Kong? Search within yourself for the thing you love most about the instrument or the music. And then throw yourself into that without any fear. Obstacles may come from other people’s opinions about what you should do but, if that happens and anyone says to you that you shouldn’t play this or that, show fearlessness. When you listen to yourself you realise you can do it now. What does the future hold for Steve Vai? In reality I don’t know! But I do like to create some plans now and then. I’m looking forward to taking my Passion and Warfare 25th Anniversary World Tour to South America, Mexico City and Puerto Rico this summer. I’m also looking into organising more Generation Axe shows. I mean, these are great shows. I also want to make another guitar record. I feel it’s time. So, the gig again: how would you persuade a Hongkonger to come along who loves rock and guitars but doesn’t necessarily know your work? By doing interviews like this, ha! No, I’d tell them not to miss this show if they’re a guitar lover. They’re going to want to be there.